Ayam kecap or ayam masak kicap is a Maritime Southeast Asia chicken dish poached or simmered in sweet soy sauce (kecap manis or kicap lemak manis) commonly found in Indonesia and Malaysia. Ayam kecap panggang served in a buffet in Jakarta. 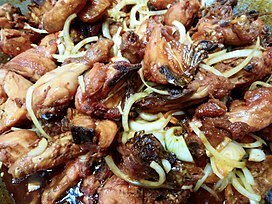 In Indonesia, ayam kecap is pieces of chicken simmered in kecap manis (sweet soy sauce), spiced with shallot or onion, garlic, ginger, pepper, leek and tomato. Other version might add richer spices, including nutmeg and cloves. In Indonesia, the term ayam kecap is often interchangeable with ayam goreng kecap (a variant of ayam goreng in sweet soy sauce) and semur ayam, Indonesian sweet soy stew which uses chicken instead of beef. Since all of them are actually similar — if not almost identical, recipes of chicken cooked in sweet soy sauce. However, semur ayam often add richer spices, which includes clove, cinnamon and star anise. On the other hand, ayam goreng kecap has thicker sweet soy sauce and often added with slices of fresh lime or splash of lime juices. The main difference probably is its water content, despite quite moist, both ayam kecap and ayam goreng kecap are usually dryer and has thicker soy sauce compared to semur ayam which is more watery. In Indonesian, fried chicken in sweet soy sauce is a typical chicken dish commonly served across Indonesia. However, it is more precisely of Javanese-Chinese origin. 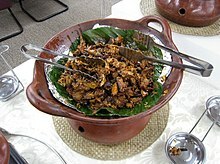 The recipe follows the production of Indonesian kecap manis (sweet soy sauce). Historically, soy sauce production is linked to Chinese influence in the archipelago. However, Indonesian Javanese version of soy sauce has its own twist, which is a generous addition of thick liquid palm sugar (gula jawa) with consistency of molasses. The ayam kecap pedas is a hot and spicier version which add generous amount of chili pepper. In Indonesia, ayam kecap commonly is poached chicken cut in pieces, which includes its bones. However, there is a variant called ayam panggang kecap which uses identical sweet soy sauce and spices, but the chicken is boneless fillet and being grilled instead of being fried. Ayam masak kicap being cooked. The Malay ayam masak kicap is different from the Chinese version of soy sauce chicken as the chicken meat is cut into pieces and mixed with its own spices. ^ a b "Ayam Kecap". Bango (in Indonesian). ^ Cheryl Moeller (2012). Creative Slow-Cooker Meals: Use Two Slow Cookers for Tasty and Easy Dinners. Harvest House Publishers. p. 102. ISBN 9780736944922. ^ Norhaslina Hassan (2006). Dinamika masyarakat bandar Malaysia: ke arah kualiti hidup mapan (in Malay). Penerbit Universiti Malaya. ISBN 978-983-100-376-3. ^ Charles Gordon Sinclair, ed. (1998). International Dictionary of Food and Cooking. Taylor & Francis. ISBN 9781579580575. ^ "Ayam Panggang Fillet". Cookpad (in Indonesian). ^ Betty Saw (15 September 2014). Best of Malaysian Cooking. Marshall Cavendish International Asia Pte Ltd. pp. 9–. ISBN 978-981-4561-98-3. This page was last edited on 12 March 2019, at 02:49 (UTC).